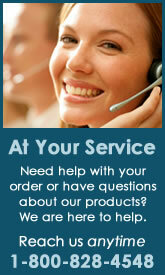 Below you'll find details on various ways to find products on our site. The index along the top of the screen is a popular method of finding items. Clicking on a letter will take you to index pages, similar to what you would find in the back of a catalog or reference book. These index pages contain listings for types of products and brand names. 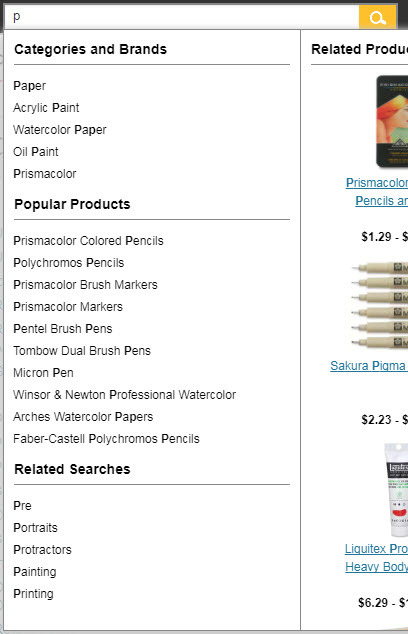 So to browse for "pastels" or "Prismacolor", you would click on letter P.
Just point your cursor over the departments link under the Blick logo, and a drop down menu providing quick access to our most popular categories will show up! 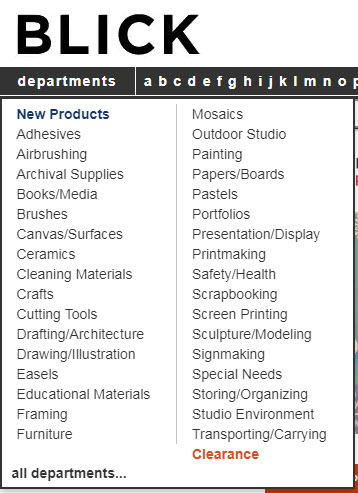 When you click on the department that you want, you will be taken to a page that contains a listing of products within that category. Click on the product that interests you to see specific details, description, and images. If you want to see a full listing of all our departments, just click on the "all departments" link at the bottom left of this drop down box and you'll link to a page that lists all our departments. If you want to see a full listing of all our departments, just click on the "see more..." link at the bottom of the listed categories and you'll link to a page that lists all our departments. There is a list of our most popular brands that displays in the left-rail of our homepage. The brands listing is listed above the departments that were discussed above. Just point your cursor over the Brands header in the left-rail, and the listing of our most popular brands will show up! When you click on the brand that you want, you will be taken to a page that contains a listing of products associated with that brand. Click on the product that interests you to see specific details, description, and images. As you type in our Search box, we will present “quick links” that match the letters you’ve entered to expedite your search. If you click on one of these quick links, you will be taken to the product, category, brand, or other page identified by the link. When you choose a quick link, you will bypass search results. Use our search feature by typing in a word, number, phrase, or product number then click on Search. You'll find a comprehensive list of pages containing your term. Gifts — Under the Gifts link in the header, you'll find easy access to buy Blick Gift Cards, as well as our Gift Ideas section. In the Gift Ideas section, you will find hundreds of great gifts organized by discipline, price level, and gifts for children. It's a fabulous place to get ideas for the artist in your life! 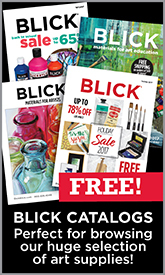 Clearance — Just click on the red Clearance button in the header to check out our full Clearance Section and find unbelievable deals from Blick! Featuring products from across all our categories, we always have something special on Clearance for any budget. But order quickly, these deals here won't last long!